This week, we visited Cavalia Village which is rising up on Soldier Field’s South Lot preparing for the Midwest premiere of ODYSSEO, a high-energy, high-tech extravaganza billed as the largest touring production in the world. We talked to the artistic team and performers, and had a chance to meet the real stars of the show, 65 horses, who will run free on the massive stage. Odysseo by Cavalia opens April 1st. Mary Poppins floats into the Mercury Theater with previews this weekend. Mamma Mia runs through April 16th at the Marriott Lincolnshire. Looking ahead, Tarzan, Harvey and Shakespeare in Love are all in rehearsal. Exhibits of interest include a retrospective of MBC@35 at the Museum of Broadcast Communications and Henry Dager Source Materials on display at the Intuit Museum. 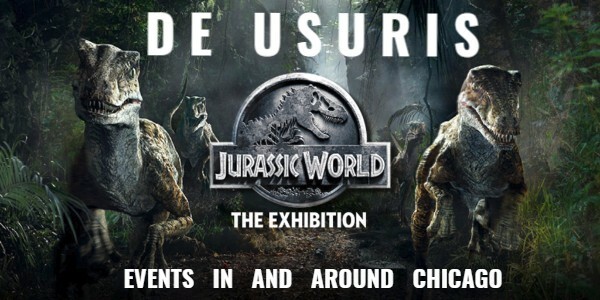 Jurassic World is coming to the Field Museum, so if you are interested, reserve tickets now for the May opening. There is music all over tour with Beckie Menzie and Tom Michael every weekend in April at Davenport’s, Elaine Dame and Paul Marinaro at Winter’s Jazz Club, and you might still be able to get in to see the extraordinary Bernadette Peters at the Auditorium Theatre on Friday, March 31st. College hockey is still a favorite, especially when your hometown team from Northfield, Vermont wins the DIII NCAA Men's Hockey Championship for the 4th time! Congratulations, Norwich University! You can see the DI NCAA Championship next week right here in Chicago. There will be a special Monday Night Live at Petterino’s featuring Waa-Mu from Northwestern students. Always entertaining! Oh, and baseball returns next week … but you already knew that!